Lunch Date with Your Little Cupid – KIDS EAT FREE! - Show your little cupid just how wild you are about them by treating them with a delicious treat! OnSaturday, Feb. 7 and Sunday, Feb. 8, from noon- 4 p.m., all four Atlanta-area Melting Pot locations invite you and your little heartthrob to enjoy a three-course fondue feast to celebrate St. Valentine’s holiday. Bring in a Valentine for a patient at Children’s Healthcare of Atlanta and receive UNLIMITED chocolate fondue! Valentine's Celebration at The Melting Pot - This unique Valentine’s idea will be the best one you have made yet! From a burst of joy after a bite of fondue, or a satisfied sigh after a sip of wine, to the simple sparkle of a smile, or a twinkle in an eye—there will surely be fireworks. Only instead of just watching them, you’ll be creating them. On Friday, Feb. 13 & Saturday, Feb. 14, indulge in a four-course prix menu starting at only $65 per person. (Regular menu will not be available from February 13 & 14). 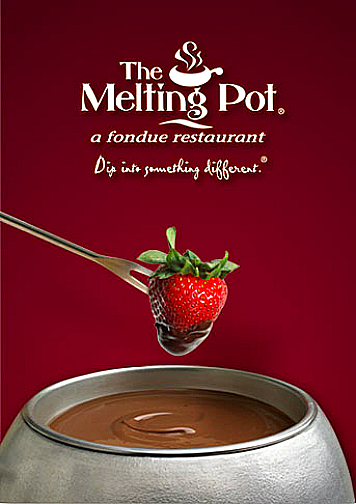 National Chocolate Fondue Day 2/5 - At The Melting Pot, we love chocolate. And thanks to National Chocolate Day, we officially have an excuse to indulge (as if we really needed one). February 5 is National Chocolate Fondue Day and we are offering FREE* milk chocolate fondue all day with the purchase of a three-course meal! Make sure to call for reservations and mention this great offer to satisfy your sweet tooth!